Loved and hated by many, The Twilight Saga has established itself as one of the most controversial franchises of our generation; each installment has been progressively beaten to a pulp by critics yet raked in huge profits at the box office and pleasing it's large fanbase. And now, after four years of this crap, we come to the second part of the 'epic' conclusion - that is, if there was anything to conclude in the first place. Immediately after her rebirth as a vampire, Bella Swan (Kristen Stewart) lives in peace with her husband Edward (Robert Pattinson), their daughter Renesmee (Mackenzie Foy) and the rest of the Cullen family. 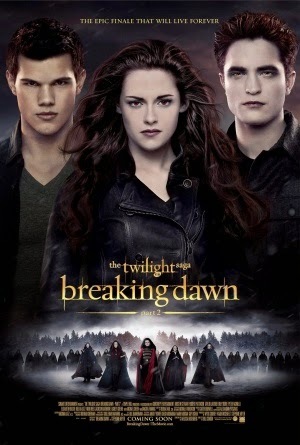 Having initially been accepted by the The Volturi, Bella's status as a vampire and the lives of the Cullen family are at stake when their baby is mistaken for an immortal child, a breed of vampire incapable of restraint, leading to a race against time before The Volturi's punishment is made for a crime never committed. What's so bad about The Twilight Saga overall? There are too many things to answer that question with. Not only is the contrived, poorly written romance a bad enough aspect, but the terrible scripts, atrocious acting and non existent overall narrative threads together a string of five awful films into a forced mess. Nothing is emotionally stirring nor gripping, and the characters portrayed exude no likeable factors. Being consistent with this poor reputation, Breaking Dawn - Part 2 recycles these negative conventions and tops it off with some extra awfulness. The main factor that contributes to the poor quality of the film is the fact that it does not feel like the epic finale it is marketed to be - okay, I'm not saying film marketing is ever the pinnacle of honesty, but this is a film that concludes a major franchise. What it actually feels like is a clueless, mindless cobbling together of boring scenes with no sense of direction. The majority of the film seems to revolve around the main characters sitting in nicely furnished houses and discussing plans of action, annoying vampire jokes and the dull, droning narrations of Bella. Rather than deliver subtle exposition, the film seems to explain even the most obvious of plot points to the audience as if we're idiots. Then again, anyone who's attending a screening of the film might as well be treated as such, even myself. The film culminates with a rather good if absurd final battle, but a huge anticlimax drives this into the ground and leads to to one of the worst 'resolutions' in film history. The film has little to redeem itself from the nonsensical and pale story, the bad characterization and the above awful CGI special effects, and in comparison the explosive nature of other conclusive films like Deathly Hallows - Part 2 and The Dark Knight Rises, Breaking Dawn - Part 2 is just another dull entry to a dull franchise and is, praise god, the last we have to endure.